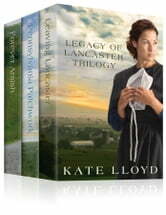 For the first time, enjoy this Legacy of Lancaster Trilogy collection! These three novels will transport you to the intriguing and little-understood world of the Amish. Join these courageous women as they unravel the mysteries of their pasts, finding forgiveness and new beginnings along the way. More than anything else, thirty-something Holly Fisher longs for family. Growing up in Seattle without a dad or grandparents, she wonders what it would be like to have a heritage, a place of belonging. Holly is shocked when she learns that the family she’s never known lives on a Lancaster, Pennsylvania, farm—as part of an Amish community her mother once abandoned. Seattle native Holly Fisher is smitten by Lancaster County, its simplicity and her long lost relatives. In the sequel to bestselling Leaving Lancaster, Holly embraces the Amish culture, learning to slow down to see what—and who—really matters. Sally Bingham needs some time away to rethink her upcoming marriage. She takes off for a bed and breakfast in Lancaster County for a weekend and ends up in the home of a mysterious Amish woman named Lizzie. Lizzie introduces her to a different perspective on life, a charming farmhand named Armin— and opens a Pandora’s box that will forever change Sally’s life.